The Amarna letters (sometimes "Amarna correspondence" or "Amarna tablets") are an archive of correspondence on clay tablets, mostly diplomatic, between the Egyptian administration and its representatives in Canaan and Amurru during the New Kingdom. The letters were found in Upper Egypt at Amarna , the modern name for the Egyptian capital of Akhetaten, founded by pharaoh Akhenaten (1350s – 1330s BC) during the Eighteenth dynasty of Egypt. The Amarna letters are unusual in Egyptological research, being mostly written in Akkadian cuneiform, the writing system of ancient Mesopotamia rather than ancient Egypt. The known tablets currently total 382 in number, 24 further tablets having been recovered since the Norwegian Assyriologist Jørgen Alexander Knudtzon's landmark edition of the Amarna correspondence, Die El-Amarna-Tafeln in two volumes (1907 and 1915). 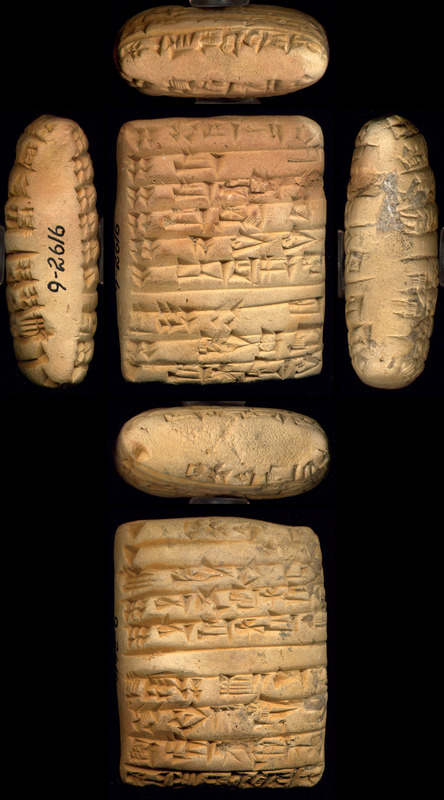 These letters, consisting of cuneiform tablets mostly written in Akkadian – the regional language of diplomacy for this period – were first discovered by local Egyptians around 1887, who secretly dug most of them from the ruined city (they were originally stored in an ancient building archaeologists have since called the Bureau of Correspondence of Pharaoh) and then sold them on the antiquities market. Once the location where they were found was determined, the ruins were explored for more. The first archaeologist who successfully recovered more tablets was William Flinders Petrie in 1891–92, who found 21 fragments. Émile Chassinat, then director of the French Institute for Oriental Archaeology in Cairo , acquired two more tablets in 1903. Since Knudtzon's edition, some 24 more tablets, or fragments of tablets, have been found, either in Egypt, or identified in the collections of various museums. The tablets originally recovered by local Egyptians have been scattered among museums in Cairo, Europe and the United States: 202 or 203 are at the Vorderasiatisches Museum in Berlin ; 80 in the British Museum ; 49 or 50 at the Egyptian Museum in Cairo; seven at the Louvre ; 3 at the Pushkin Museum ; and 1 is currently in the collection of the Oriental Institute in Chicago . The full archive, which includes correspondence from the preceding reign of Amenhotep III as well, contained over three hundred diplomatic letters; the remainder are a miscellany of literary or educational materials. These tablets shed much light on Egyptian relations with Babylonia, Assyria, the Mitanni, the Hittites, Syria , Canaan, and Alashiya (Cyprus ). They are important for establishing both the history and chronology of the period. Letters from the Babylonian king Kadashman-Enlil I anchor the timeframe of Akhenaten's reign to the mid-14th century BC. Here was also found the first mention of a Near Eastern group known as the Habiru, whose possible connection with the Hebrews remains debated. 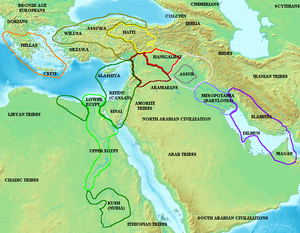 Other rulers include Tushratta of Mittani, Lib'ayu of Shehchem, Abdi-Heba of Jerusalem and the quarrelsome king Rib-Hadda of Byblos , who in over 58 letters continuously pleads for Egyptian military help. Note: Many assignments are tentative; spellings vary widely. This is just a guide. From the internal evidence, the earliest possible date for this correspondence is the final decade of the reign of Amenhotep III, who ruled from 1388 (or 1391) BC to 1351 (or 1353) BC, possibly as early as this king's 30th regnal year; the latest date any of these letters were written is the desertion of the city of Amarna , commonly believed to have happened in the second year of the reign of Tutankhamun later in the same century in 1332 BC. Moran notes that some scholars believe one tablet, EA 16, may have been addressed to Tutankhamun's successor Ay. However, this speculation appears improbable because the Amarna archives were closed by Year 2 of Tutankhamun, when this king transferred Egypt's capital from Amarna to Thebes. See the town of "Lakiša", Lachish , for "find" of one tablet, EA 333. Encyclopedia of el-Amarna Contains summaries of the letters. Article explanation of 6 views of a Tablet-letter.